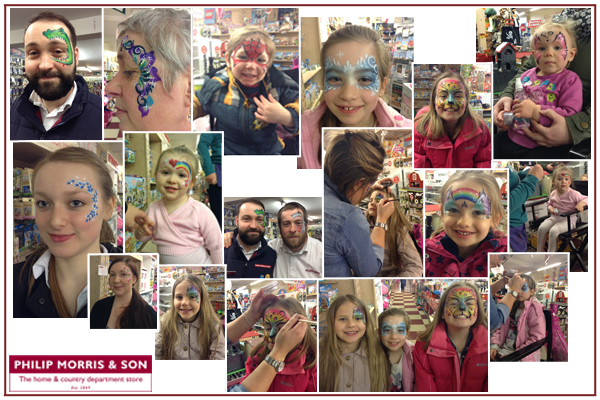 Here at Philip Morris & Son we spent our Saturday afternoon painting our faces funny for money. We invited the public to come along and join us to help raise money for the Comic Relief Foundation and help support them in all of the wonderful work they do. With everyone’s generous donations we managed to raise an outstanding sum of £60.00! Every single penny of the money raised will go straight to Comic Relief, which will give them that extra little bit of a helping hand that they need to make a difference. So a huge thank you to everyone who took part and got their faces painted something funny for money, you all looked fantastic! A big thank you to all who contributed to our fund raising pot, your donations will make a significant difference to many. A very special thank you to the very talented Lucy’s Glitter Bugs, who definitely made the afternoon come to life with her artistic hand. Comic Relief, Face Painting For Charity, Fundraising, Funny For Money, Philip Morris. Bookmark.